As we end the month of March, please meet another group of amazing ladies who grace our office every day. 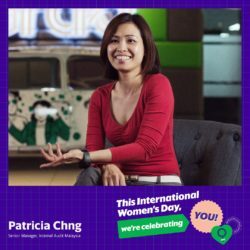 My career in Grab began when I had a ride dispute. While looking for the customer service contact number, I chanced upon their career page. The company’s mission and product appealed to me and moved me to apply for a job. After all, if I wanted to evoke change, why not from the inside? And so, within 10 days, I started my first day in Grab and have not regretted it since. 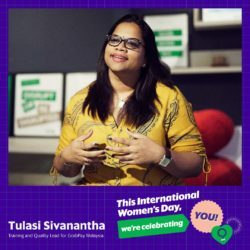 I am part of the GrabPay team and my role requires me to train and monitor for quality assurance. The Grab culture encourages me to be ourselves, motivate and empower each other especially during the tough days, and help the other expand our knowledge about our work and industry. This, I believe is an environment which allows one to progress and develop their skills in a healthy environment. In addition to that, my confidence has escalated and every day, I look forward to embracing new challenges that come my way. Generally, if I had one advise to a lot of young working adults, is to always have the right attitude, then aptitude will follow suit. Always be open and willing to learn new things, even though it may seem difficult at first. I was excited to work with Grab (then known as MyTeksi) after I heard Anthony Tan spoke passionately about his company. I joined in December 2015 and it has definitely taken me out of my comfort zone and opened my eyes to the industry. Heading the operations team requires me to oversee the entire infrastructure from acquisition of drivers to retention and even termination. One of my main challenge is to find a balance between the most affordable rates for passengers and the most rewards for drivers. Moreover, coming from a consultancy background, I never have to deal with people on a personal level, but during a major driver-partner acquisition event, I got to know many drivers and it has helped me realised the importance of understanding and getting to know the people we serve, and this in turn, has certainly impacted me and every decision we make. To be honest, though we are a tech-based company, the tech only happens within the first three minutes when you book the car and when your ride is complete. When you get in the car, it’s all about the interaction between the driver and his/her customer. So, the human touch really makes or breaks the ride experience; and as I recall Anthony once said, happy drivers, means happy passengers. If there was one advice I could give to any woman, it would be for them to be fearless and step out of your comfort zone – you never know what great things you can accomplish! My love for geography and technology is the main reason I pursued surveying – which is quite uncommon for women, but it eventually led me to Grab. My job as the Map Ops lead involves ensuring every possible point of interest or location is successfully detected by our mapping system. This also involves going on-ground to detect the best pick-up/drop-off points. Many have asked me what it’s like being in a job that is typically male oriented. 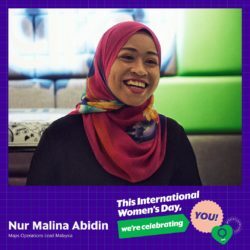 And moreover, prior to joining Grab, I heard many stereotypical opinions that it is quite a male dominated environment because it is a tech company. However, I honestly, have never felt nor feel this way, even though I am the only female in my team. My team mates and I are the pioneers who started the matrix and monitoring system for Grab. In fact, whenever passengers or drivers complain about our points of interest, we take it as a challenge to improve it. I count my blessings every day as I do not have to hide behind a laptop, instead as a lead, I am given opportunities to move out of my comfort zone. And together with my team, we not only respect each other, but we are constantly learning, growing and constantly improving ourselves, our knowledge and the system. Being in the media and communications industry, I always had a passion for writing. So, when I spotted an advertisement on a Facebook page that someone was looking for a writer, I didn’t think anything about it and just applied. Little did I know it was for Grab. I was ecstatic and couldn’t contain my excitement. To me, the idea of working with one of Southeast Asia’s biggest brands was appealing. 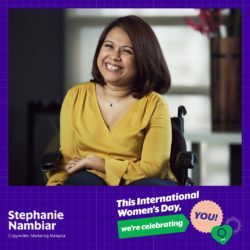 The job itself was never an issue, but because of my disability, it took a bit time for everyone to adjust to me moving around the office in my wheelchair. I recalled my first day when my colleague and I explored what would be the easiest route to get from the lobby, up to the office and to my desk. But honestly, after a day or two, no one bat and eyelid watching me rolling around, and I quickly became a part of the team. My driving factor has and will always be myself – I strongly believe in being independent. I feel if I relinquish my independence, a deep sense of helplessness will form within me. I would never want anyone to say I couldn’t achieve anything because of my physicality. As a writer, my advice to any writer – male or female is to never take people’s criticism personally. When you write, give it your all but let it go completely when someone else is viewing your piece. If you focus so much on people’s opinion, you will eventually feel demotivated to write. I joined in 2015 when Grab was still MyTeksi. I took a significant risk in joining a start-up after years of working in multi-national companies. I chose to be part of Grab as it is something new and the job scope increased my curiosity. My job requires me to ensure all Grabbers comply with company regulations and pursue investigations if issues arise. There were many challenges I face as not many people have experienced an internal audit session. Three years on, am certain I have made the right choice in joining Grab. The years have also thought me to not to take things personally, to empathise more and to be creative in approaching situations. 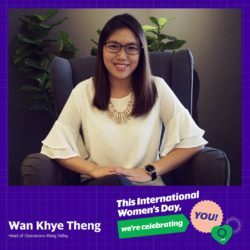 If there is one thing I enjoy most about working in Grab is being amongst the many young and vibrant people, especially women who are willing to embrace risk in anything they do. If I could give any women out there a piece of advice, it would be for them to believe in themselves and be confident that they are contributing to the growth of the society. Woman need to believe they can be a great working mother instead of continually demeaning themselves. We want to thank each of the ladies we have introduced in our Inspiring Women series for sharing their thoughts and a bit of themselves. Click Vol 1 and Vol 2 to read about our other women. !